I didn't think I'd manage to do a TFIL this week at all. The LSH was flying back from London, arriving in Marseille at 10am on Friday morning (so I thought) and the Maréchal-ferrant (farrier) was due to be at the farm for the morning. I thought I'd be able to pick up the LSH, whizz home (it's a little over an hour's drive) and be up at the farm by 11.30am. Then he texted me to say his flight was arriving at 10.50. Ok, Plan A was clearly not going to work. Plan B was that he would get the bus to Manosque from the airport and I would collect him there after meeting the maréchal and seeing what he had to say and do about the horses' feet. Seeing as this is a food post, I won't go into details about the maréchal, save to say he was very nice, very pro-barefoot and very pro-owners picking up the rasp. I headed off to Manosque with a little time to spare and found myself waiting in front of the station, facing the Buffet de la Gare. The more I looked at it, the more I thought I'd suggest lunch when the LSH arrived. Even though I was very scruffy, slightly muddy and smelled strongly of horse, the Buffet de la Gare is not a bit posh, there were loads of equally muddy construction workers going in and out as I waited, and I figured I wouldn't stand out too much in my scruffiness. The bus eventually arrived, and the LSH thought lunch was a good idea too, so we headed in and ordered the Menu du Midi - starter, main course, cheese course, dessert, coffee AND a bottle of Rose for €14 each. Our starters were a plate of charcuterie (him) and a (tinned) tuna salad (me). They arrived with the 75cl bottle of Rosé. I had to behave myself seeing as I was driving, so I only had one glass, and we ended up drinking less than half of the bottle. This must happen a lot. I guess they end up serving the left over Lunch Wine in the bar later on. The starters were both good, you can't go wrong with charcuterie - unless you're a vegetarian, of course - and the salad had a lovely mustardy dressing on it, but there's no photos of them - sorry! I wasn't thinking in terms of doing TFIL until the main course arrived and WOWed us! The main was described as Cassoulet Terrine. Cassoulet is duck, sausage and beans, all cooked slowly as a casserole, but we had no idea where "Terrine" would come into it - a Terrine is a cold, pressed meatloaf sort of thing (although it doesn't have to be meat). Were we going to be faced with a cold, pressed cassoulet? Was it going to be a normal cassoulet with bits of terrine in it instead of the duck or the sausage? It turned out that the word "Terrine" was referring to what it was cooked in - an earthenware dish, full of delicious cassoulet - a duck leg, toulouse sausage and a big wodge of haricot beans in each, sprinkled with bread crumbs and crisped under the grill. It was really hearty winter food, absolutely delicious, and very, very filling. The LSH ate most of his, apart from some of the beans, but I'm ashamed to say I could only manage to eat half of mine. I honestly felt guilty about this - what if they thought I didn't like it? The waitress was very understanding though, and didn't send the chef out to see the woman who hadn't cleaned her plate. Tarte au Poire was all gone - poor LSH was distraught - and we both opted for Café Crème, which apparently is something of a French classic, but we'd never had it before. 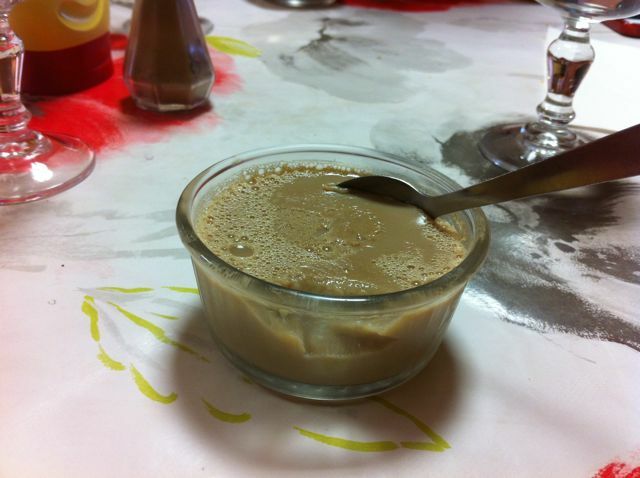 It was like blancmange with a hint of coffee flavouring. In its favour, it was very light and easy to eat after that big, filling bowl of cassoulet, but it was also very bland and quite probably came from the chiller section of the local supermarket. A coffee each rounded off the meal and we paid our €28 and left. 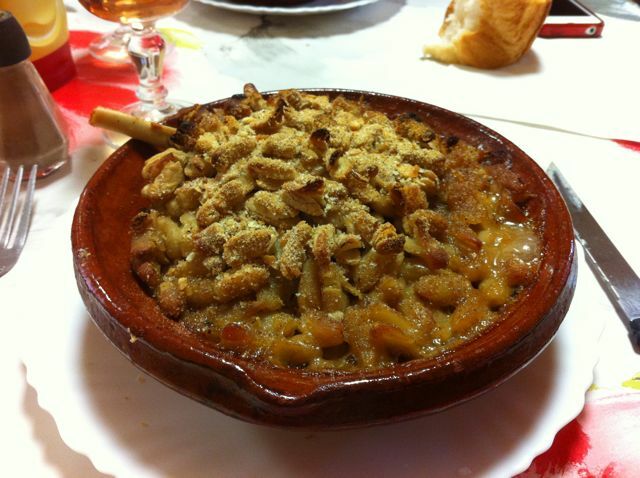 The overall verdict was that it was better than the previous visit - that cassoulet was really special! - so we awarded an extra star in "Food"
Your food posts are beautiful, descriptive and mouth watering. Generally speaking, the meals are very different from what we get here in small village, USA.